Chullanté is BGA senior advisor for Sri Lanka. His command of economic, political and social trends in Sri Lanka makes him a unique leader with a broad and deep network throughout the country. Chullanté previously served as Sri Lanka senior technical advisor for local economic governance at The Asia Foundation. He has over 30 years of experience in trade and investment promotion, private sector development, policy planning implementation, management of chambers of commerce and international development cooperation. He is a United Nations Economic and Social Commission for Asia & the Pacific (UN ESCAP) trainer-of-trainers in maritime transport and freight forwarding. 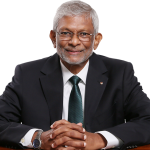 His previous positions include 16 years leading the Ceylon Chamber of Commerce, including as secretary-general of the Sri Lanka Shippers’ Council. He was a senior consultant to GTZ Sri Lanka, project manager at the United Nations Development Program (UNDP) Invest-in-Peace Project and program manager and field coordinator of the UNDP Sri Lanka Tsunami Recovery Unit (2006). He also served as executive director of the American Chamber of Commerce in Sri Lanka for three years until 2011. Chullanté received the U.S. Department of State’s International Visitor Leadership Development Program Award for the private sector in 1993. He is a chartered transportant and a member of the Chartered Institute of Logistics and Transport United Kingdom, with professional qualifications in international logistics and transport. Chullanté has post graduate qualifications in international business and international trade law from the Monash University, Melbourne, Australia. He holds dual Australian and Sri Lankan citizenship.